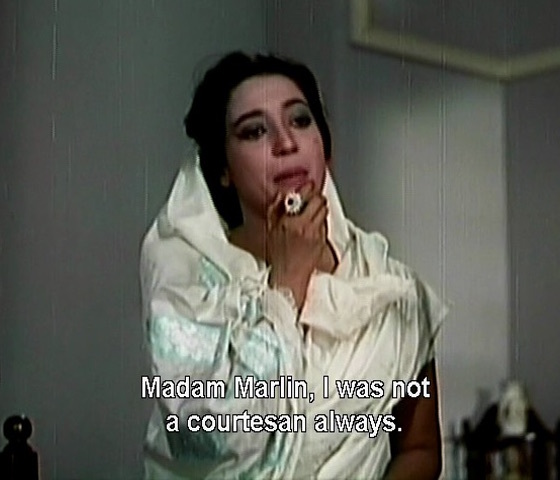 Mamta manages to combine every single one of these devices, and (as do so many tragic courtesan films) adds great music as a bonus. Pannabai does not yet know how true those words will prove to be. Backstory time! 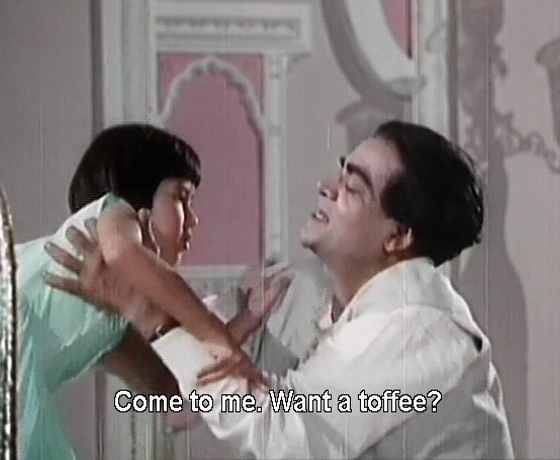 We learn that as a young woman Devyani fell in love with a poor law student, Manish (Ashok Kumar). He went to London to study law for three years, and the lovers pledged themselves to one another: they would marry on his return. 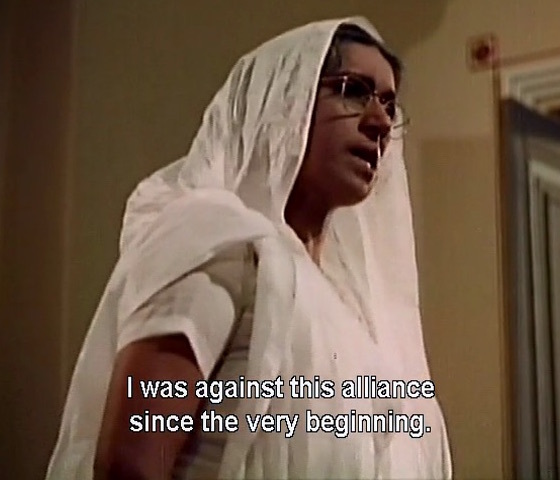 But when Rakhal tries to force her to sleep with other men (who have clearly paid him for the privilege), a pregnant Devyani realizes she must escape. And now, Pannabai tells Mother Mary, she wants to save the daughter she has raised from her dissolute father, "and from myself." Mother Mary is moved by her story; on Pannabai's promise to have no contact with her daughter, Suparna is accepted into the convent school. It's Manish, returned from London and now a famous barrister. After exchanging a few pained words with him, she jumps into a taxi and speeds off. A friend of Manish expresses his amazement that he accosted a "cheap woman" in a department store, and fills him in about Pannabai's profession. 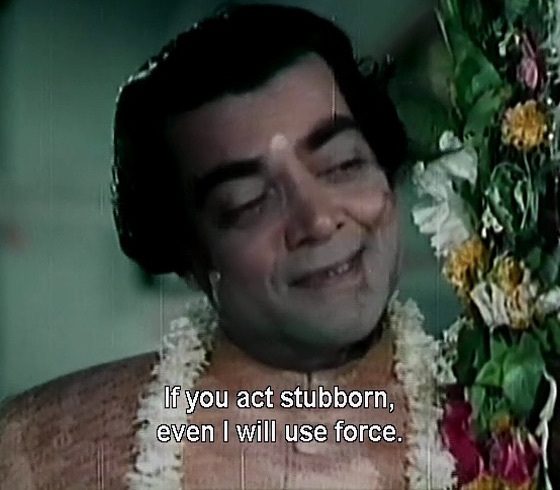 When Manish angrily expresses disbelief, his friend offers to prove it by hiring Pannabai to perform for him. That night, almost as soon as Pannabai walks in she realizes whose house she has entered. 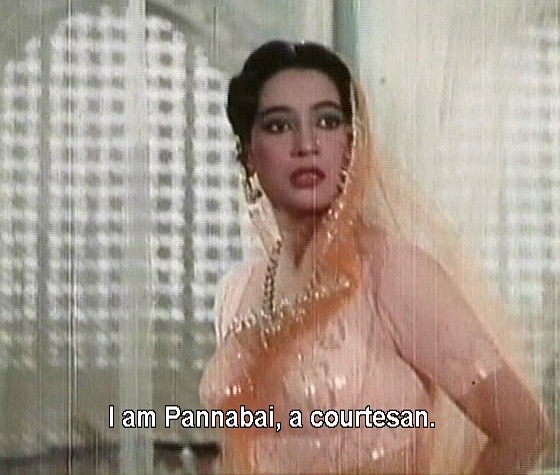 An anguished Manish conceals himself behind a curtain in another room, but Pannabai knows exactly who is listening. "I had to swallow all kinds of venom to survive; I have borne every humiliation," she sings. "Don't spurn me." 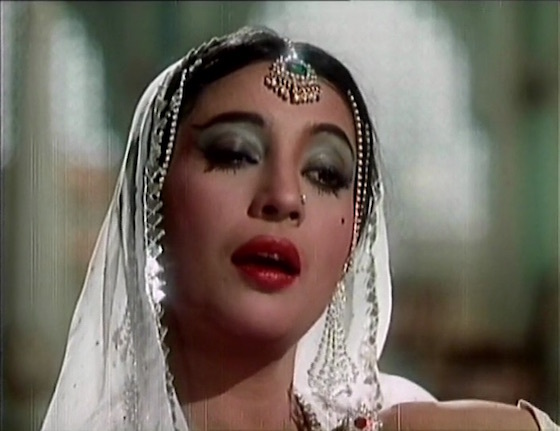 The subtitles on the version I quoted above are a bit less decorous than the ones on the embedded/linked video; Suchitra Sen's playback singer on "Rehte thhe kabhi jinke dil mein" ("The one who dwells forever in my heart") and the other songs in this post is Lata Mangeshkar. 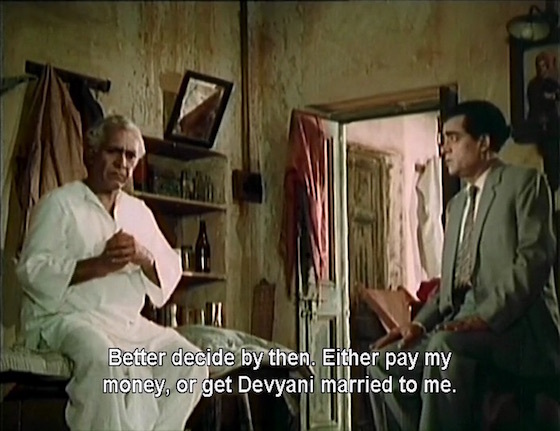 When Manish's friend tries to pay her for her performance, Pannabai disdainfully refuses the proferred money. Manish follows her home to find out what happened while he was in London. Trapped by the curfew, Manish must remain at Pannabai's. In Suparna's now-empty room over the long night, Devyani tells her story. 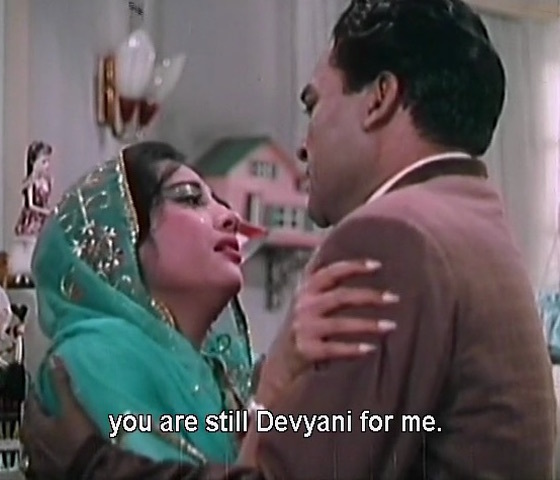 But she realizes this is impossible: Manish would be bringing home Devyani, but the world would assume he is consorting with Pannabai. This is only the first hour of the film. As the years pass and Suparna becomes a young woman, Pannabai's dream will come true—with unforeseen consequences. 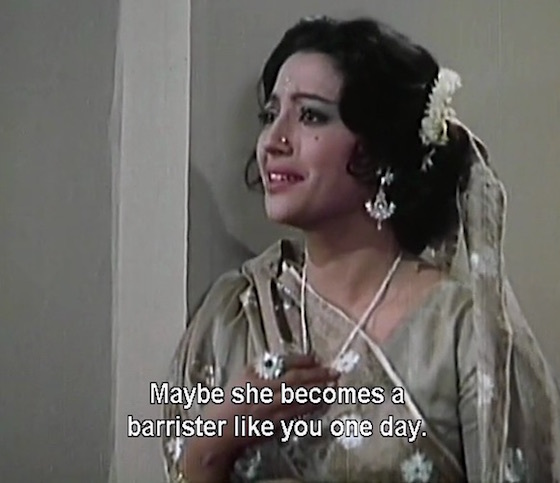 While studying law in London Suparna (Suchitra Sen in a double role) has met a classmate, Indraneel (Dharmendra), and love has begun to blossom. 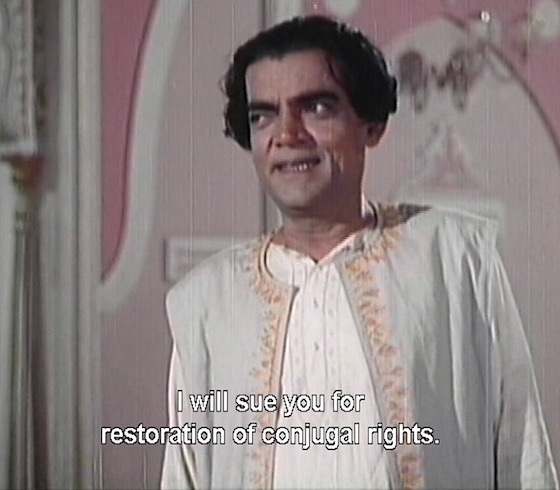 But Rakhal returns and threatens Pannabai with exposure. If Pannabai's identity is revealed, she fears that her dreams for Suparna—a professional career, a respectable home, and the love of a good man—will be utterly shattered. And a mother's love can never allow that to happen. . .
Mamta has some fairly radical-for-their-time propositions to offer: that children's destinies should not be determined by their parents' status, that women should have the same opportunities as men to enter professional life, that romantic but non-sexual friendships are possible between men and women, and that we should not judge criminal acts before understanding the extremity that may have led to them. That we still can't take these propositions entirely for granted says something about how much further we still have to go. 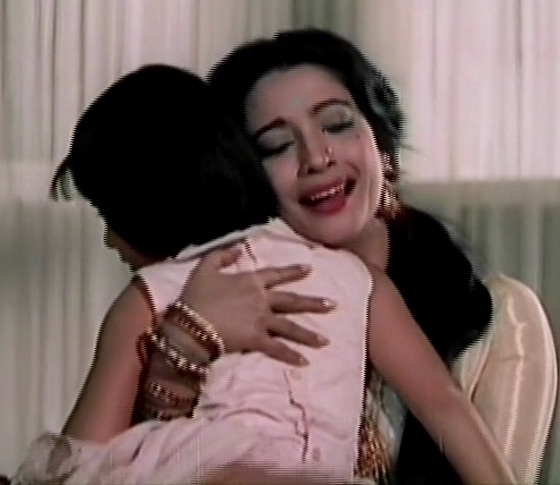 Suchitra Sen's excellent performances as Devyani/Pannabai and Suparna are the main reason to watch Mamta. She makes us feel all of Pannabai's pathos and all of Suparna's joy and hope. And although she was in her mid-30s, she convincingly embodies her characters at every age from late teens to mid-40s. 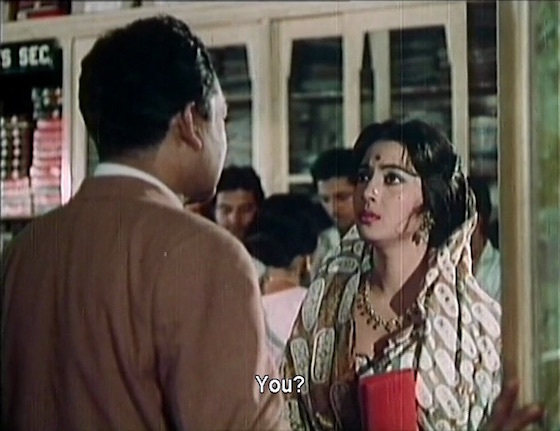 Both she and Chakravarty were reprising their roles from Asit Sen's Bengali version, Uttar Falguni (1963), which (together with Suchitra Sen's other Bengali films) is now at the top of my to-view list. 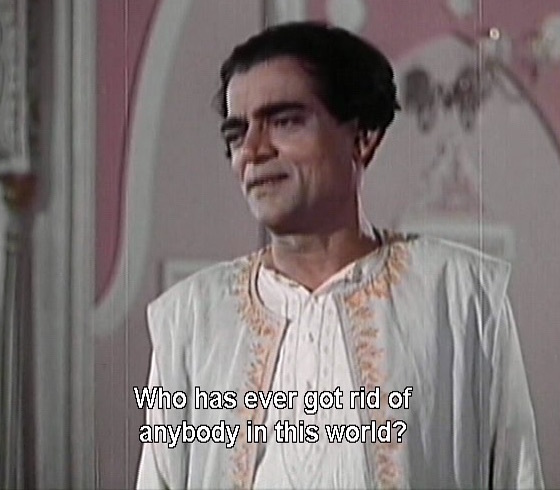 Although Ashok Kumar as a young law student is a bit of a stretch, he excels at expressing the range of emotions—from bitterness to self-accusation to deep affection—experienced by the older Manish, as "Rehte thhe kabhi jinke dil mein" shows. For another perspective please see Dusted Off's review. 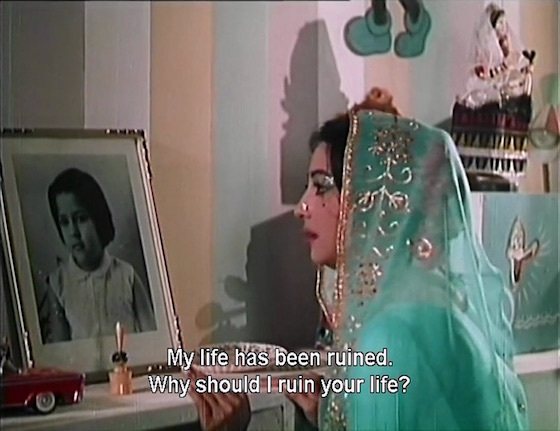 Mamta can be viewed for free on YouTube.